In Part 2 of this series I dealt with the UCreate hardware. Now we come to the software. 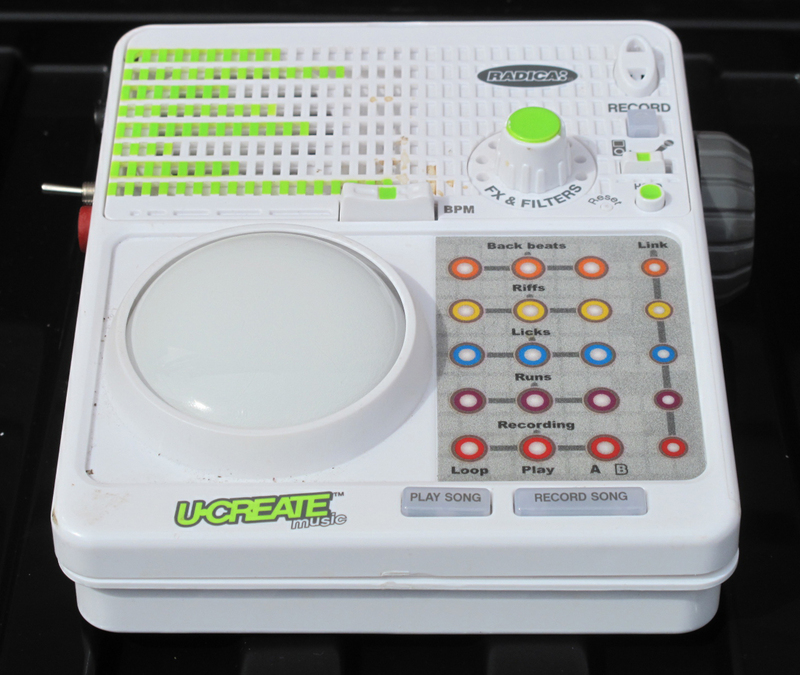 The issue of the UCreate software is a contentious one, as the software to allow users to swap around the sounds and effects in their UCreate could only be used by connecting to the UCreate website; but after a couple of years Mattel took down the website and it was no longer possible to do this. There is a long and very interesting discussion on the subject – from which many of the ideas below originate – at http://nomeist.com/ucreate-music/199. 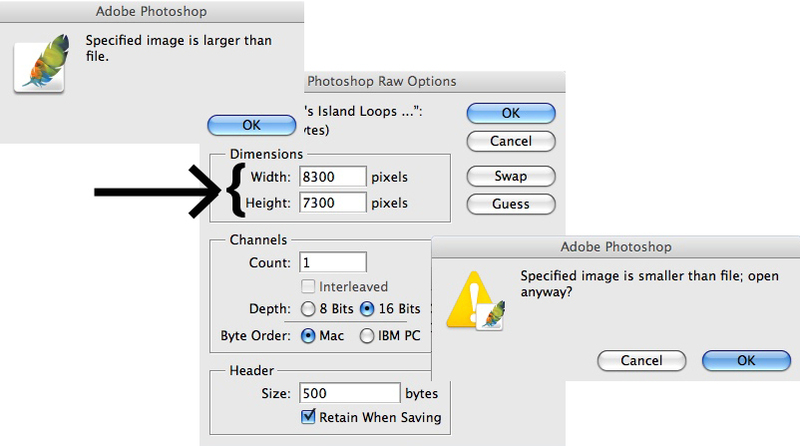 As you can’t do this now, I’ve had to rely on an old screenshot from a Windows PC. 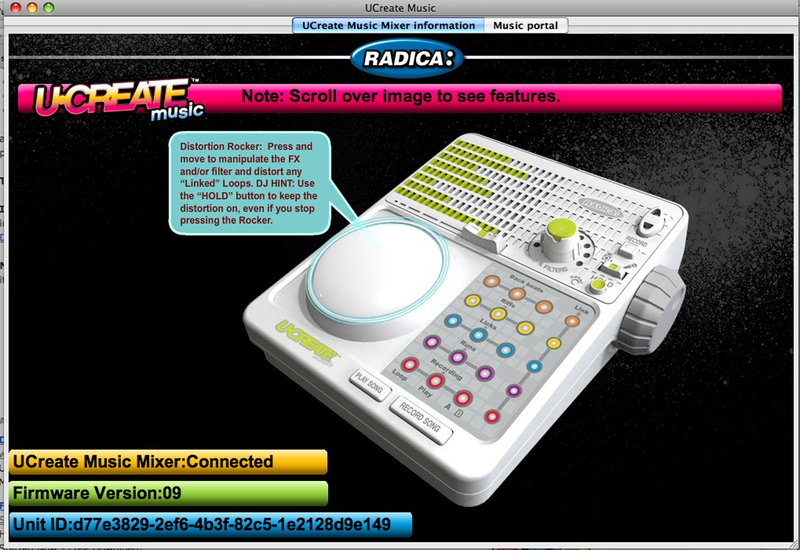 I don’t have any screenshots of what you would find when you got there, and even the Wayback Machine only shows a background image, presumably because the site operated via a Flash app; but you were able to download some alternative sounds directly to the UCreate device, and move the effects around. What users anticipated was, as time went on, more sounds and new effects would appear, perhaps even a community of users sharing their own creations. Not only was access to the existing sounds and effects withdrawn, but, worse still, also the means of loading them into the UCreate devices; and everyone who used one was stuck with whatever sounds they currently had installed. For most, this was the original sounds the UCreate came with, or one of the extra packs that had been available on the website. I had the extra packs, but couldn’t use them because there was no separate software available to install them on the machine. Some astute users had observed that the downloading process occurred in two parts: first the sounds were downloaded from the website to the host computer; then they were transferred from the computer to the UCreate. The time-lag between these two operations allowed their own sound files, suitably renamed to match those being downloaded, to be quickly substituted between downloading and transferring. The timing of this was crucial, and could be a bit hit-and-miss, so one proficient user, ‘scragz’, even wrote a routine for Macs that automated the task (https://github.com/scragz/ucreate-loader); but if these were still in the machine when the site was taken down, these were the sounds you were left with. The following article describes how samples can now be loaded into the UCreate, and furthermore how you can create and use your own samples in the device. Step 3. Load the sounds into the device. 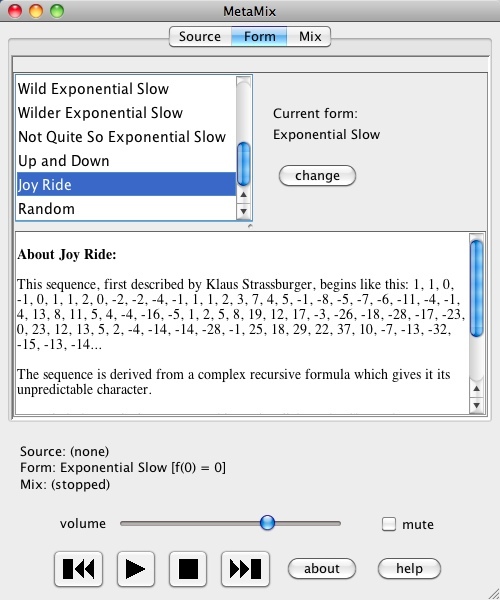 Fortunately, there is now a step by step video tutorial on YouTube at https://www.youtube.com/watchv=Ehh1fn6D2Lk&list=PLJSvyfpaaK7ESfsIWcdwDMCS-YhIw1xc4 which tells you exactly how to do it. This was made by Krimzon Ninja, who’s done some marvellous work in sorting this problem out, following on from a user by the name of ‘marbs’ who created a program a couple of years ago (http://marbs-online.blogspot.co.uk/) which he called ‘u-load’. Part 1 of the tutorial lists the programs required, and setting up the folders you need on the computer. Part 2 describes how to get your computer to recognise the UCreate. Step 1. Getting the computer to recognise your UCreate device. which is no help at all. What you need to do is install a USB driver to communicate with the device. a. Download the driver installer program ‘Zadig’ from here: http://zadig.akeo.ie/ (choose a version according to whether you’re using XP, Vista or Windows 7), and unzip it with a program such as ‘7-Zip‘. [Edit: Now, what I’ve been told is that not every version of Zadig will do. There are different versions for XP and Vista or later. I used this one: http://sourceforge.net/projects/libwdi/files/zadig/zadig_v1.1.1.137.7z/download which worked fine]. b. Start Zadig, go to the ‘Options’ menu, and select ‘List All devices’. marbs’ instructions said ‘choose GENERALPLUS-MSDC from the drop-down list’. I didn’t have this on the list, so I used the ‘Edit’ function to rename the one item that was there – I don’t know if this was necessary or not, but as there was only one file in the list, and only one USB device plugged in – the UCreate – I knew it must be the right one. Just make sure you identify the correct device or terrible things might happen! c. Then click the ‘Install Driver’ button. 1) Choose ‘List All Devices’ from the ‘Options’ menu. 2) Only one item appeared on the list, which is the long box partly hidden under the drop down menu. Probably a good idea anyway to make sure the UCreate is the only USB device connected, to avoid confusion. I checked the ‘Edit Name’ box so I could rename it ‘GENERALPLUS-MSDC’. 3) Actually, I can’t remember what was selected here. I didn’t change what it already said, which is probably what is showing here. 4) Clicking this button starts the installation. d. The installation wasn’t instant: it took a couple of minutes, and some messages came up about restarting devices. I switched the UCreate off, restarted the computer, switched the UCreate back on, and started u-load. which was a whole lot better, indicating that u-load now recognised the UCreate, and was ready to load sounds and effects into it. You only have to do this once, then your device is set up. 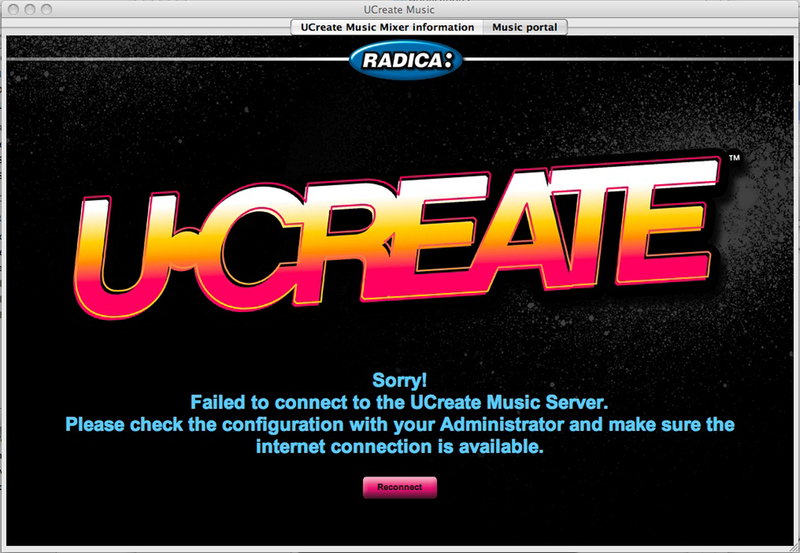 In other words, you won’t be able to use the UCreate’s original software now, unless you can do this deinstall. I’m not sure whether Zadig does this or not; but I believe it’s designed not to remove existing drivers, so it would be possible, I presume, to restore the UCreate to its original state with this or with the Windows Device Manager. It’s a moot point whether it would worth doing it, of course, since the website on which the original software depends no longer exists. (Doing this on the Windows computer, incidentally, didn’t stop the original software from running on the Mac when I later connected the UCreate to that). 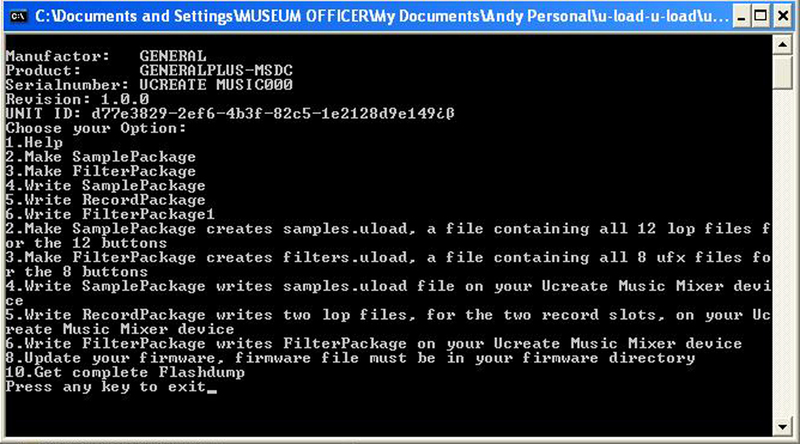 This tells you exactly what u-load can do: ‘Make’ = group your sound files together into a big file which can be used by the UCreate; ‘Write’ = load these file groups onto the UCreate. Step 2. 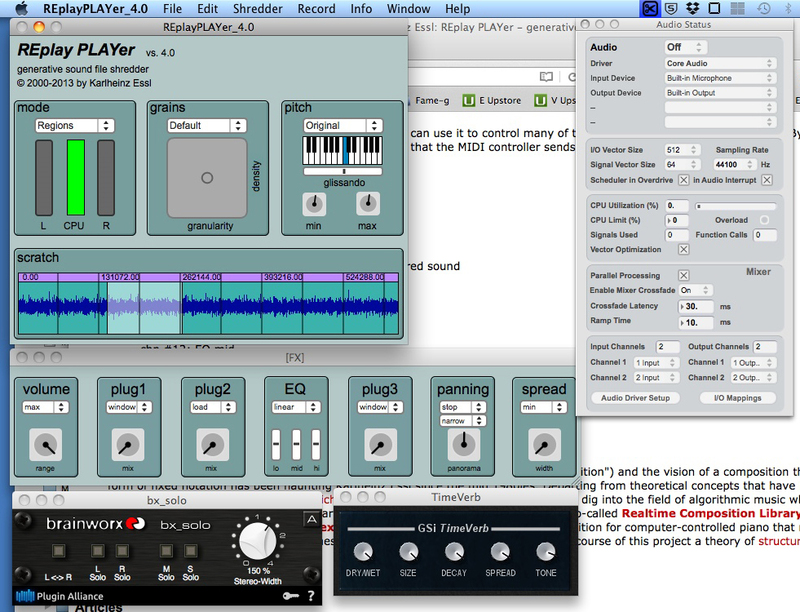 You need to create some sound files of the type that u-load and the UCreate can use (with the extension ‘.lop’). 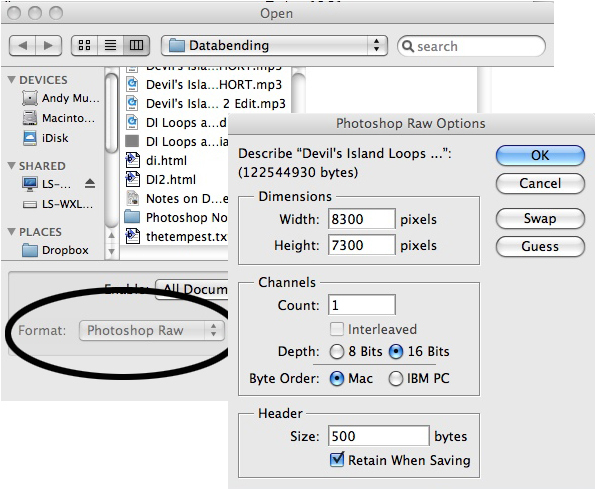 Part 3 of the tutorial video describes how to create your own samples with the program Audacity. Part 4 shows how to convert your samples to the format used by the UCreate with the programs Lopgen_a – Lopgen_e. There are some restrictions on the samples you create – principally making sure the files are not more than 5 seconds long. There were reports in the past of some UCreate devices being irreparably damaged by not doing this. 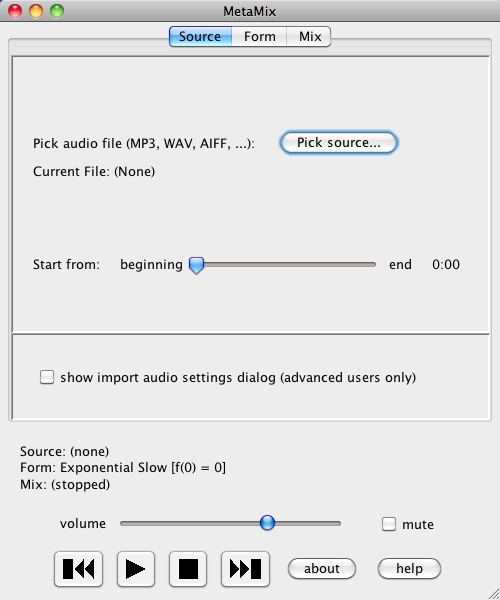 The Lopgen programs don’t require the UCreate to be plugged in, they just work on sound files stored in a particular location on your computer. All you have to do is create ‘.wav’ sound files with the correct attributes, and then have LopGenerator turn them into files the UCreate can recognise. 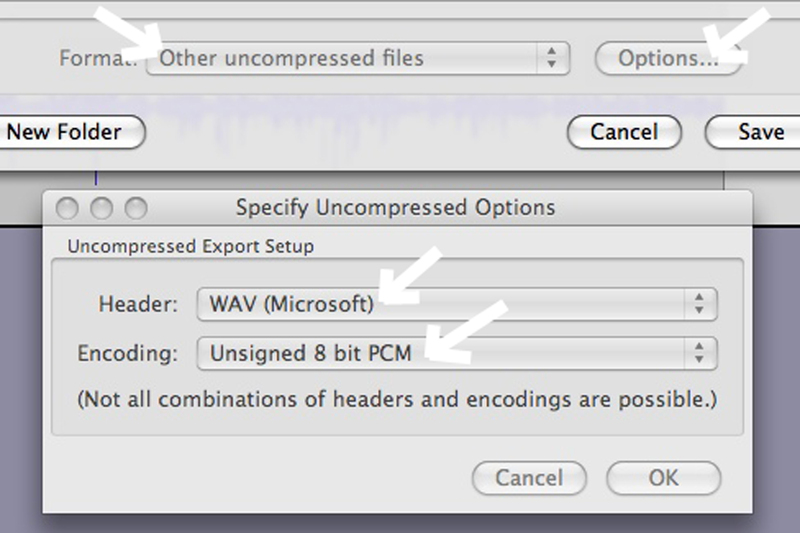 c. They’re saved as ‘Other uncompressed files’ and, by clicking ‘Options’, the header is set to ‘WAV (Microsoft)’ and they’re encoded as ‘Unsigned 8 bit PCM’. 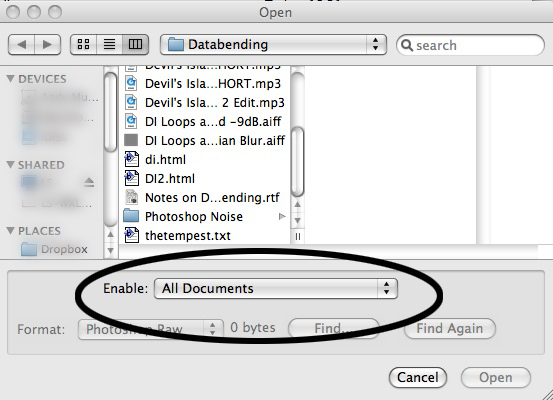 d. Finally, you need to remove all Metadata before saving the file. Once the file or files are done, copy them to the folder with the appropriate version of Lopgen in it, and run Lopgen. 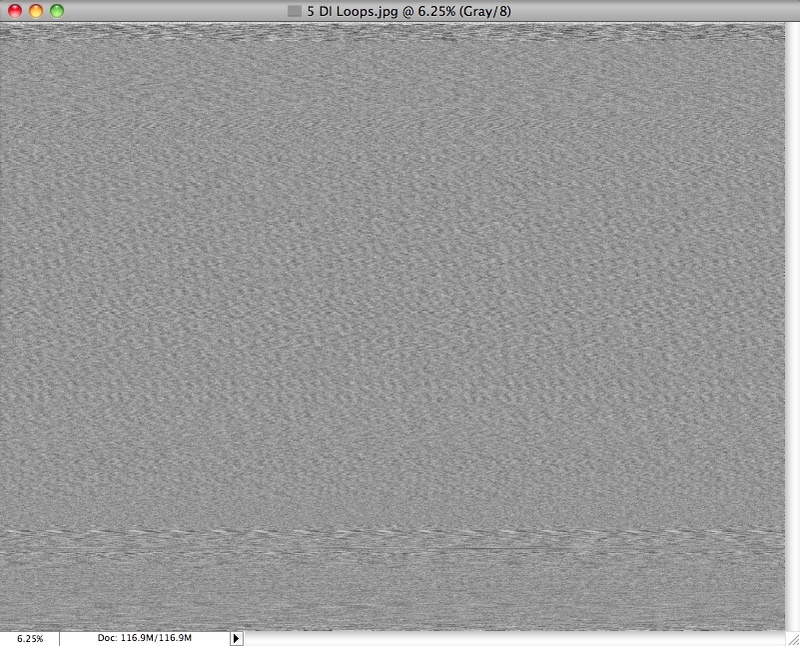 Step 3: The final step is to load the sound files into the UCreate. Part 5 of the tutorial video shows how to do this using the program ‘u-load’. To do this, you’ll be typing 2, then ENTER (‘Make SamplePackage’, as the Help screen tells you), which will create a file which you can load onto the UCreate with a ‘Write’ command. 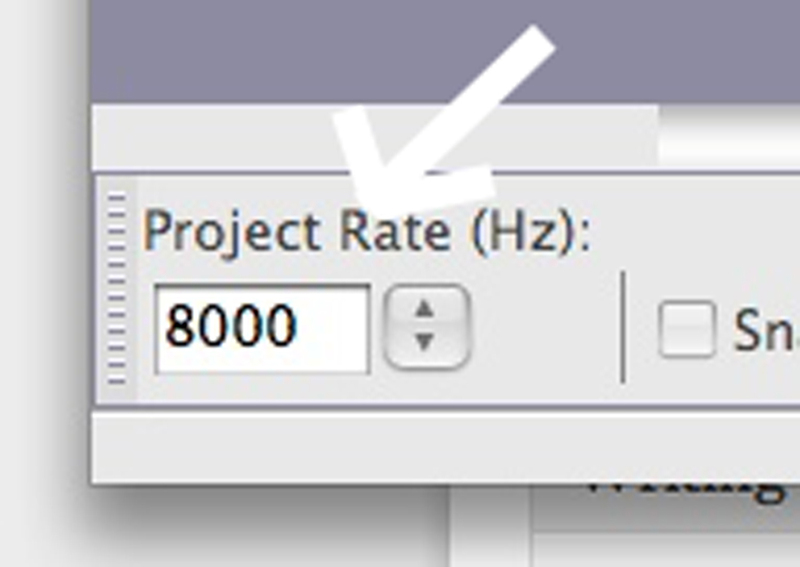 But first, you need to rename the sound files you created, and put them in particular directories. 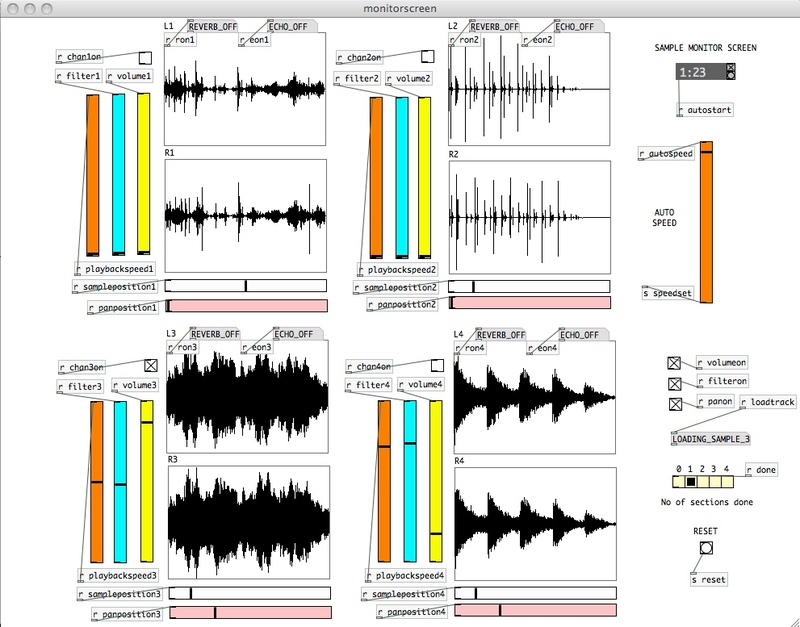 There are 12 buttons on the UCreate for sound files – not including the two at the bottom for your own recordings – so u-load will be expecting to see 12 files with the names ‘sample_0.lop’, ‘sample_1.lop’, ‘sample_2.lop’, etc., up to ‘sample_11.lop’. 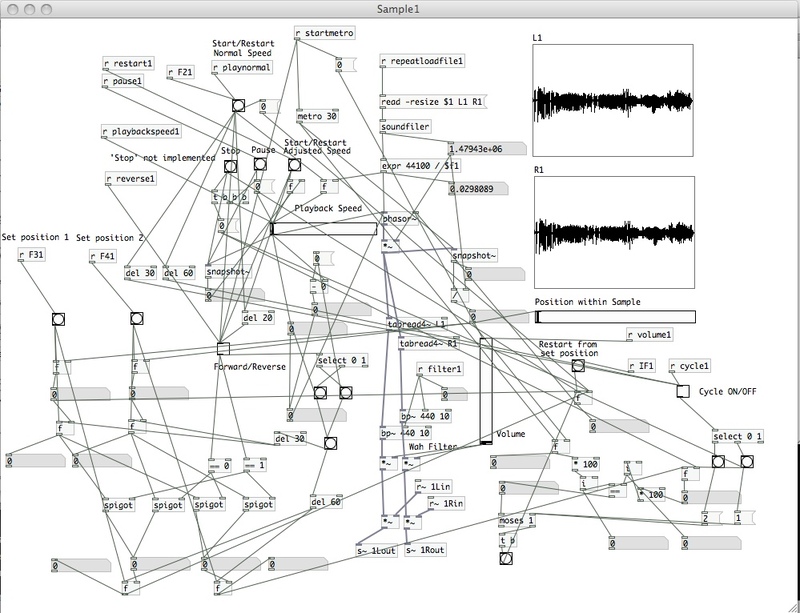 So, find the 12 sounds you want to load, rename them like this, and put them in a folder called ‘Samples’. 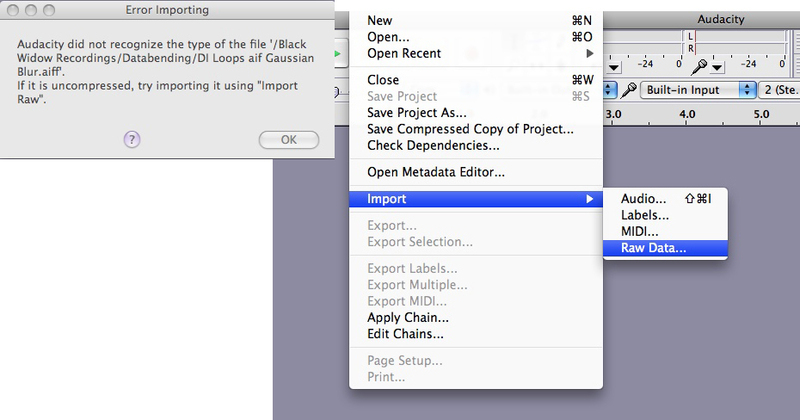 Type 2, then ENTER, and u-load will ask you to give a name for the file it’s going to create from your samples. Type in the name, press ENTER, and it will gather the 12 samples together and create the file. At this point, I had to close u-load, switch the UCreate off and on again, and reopen u-load. Type 4, then ENTER (‘Write SamplePackage’): u-load will ask you which file to upload. Give it the name of the file you just asked it to create, it will load the samples onto the UCreate, and you’re ready to go! To add files to the two spaces originally used on the UCreate for your own recordings, create .lop files as above, and put them in a folder called ‘Recordings’. They can be loaded into the two special spaces by typing 5, then ENTER (‘Write RecordPackage’). u-load will ask you for the name of the first file to load: tell it the name, and press ENTER. It will then ask you for the name of the second file: give it that, too, press ENTER, and the two files will be loaded onto the UCreate. [Particular thanks to KrimzonNinja. He acknowledges his influences at the end of the video tutorial]. In my first post on the Radica/Mattel UCreate, I mentioned adding In/Out connectors to enable the UCreate to be operated by external controls – e.g. joysticks – or the UCreate Button to be used to control other devices. This post describes two of my devices which I modified for this purpose: the StyloSim and the Black Widow. 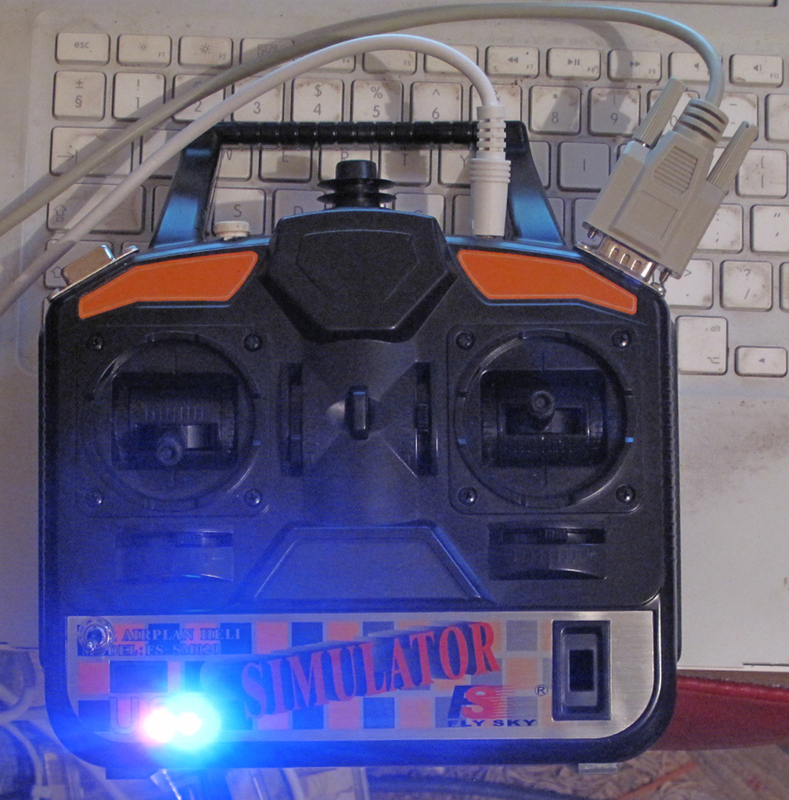 The StyloSim is a two-joystick controller, used for simple flight simulation games. 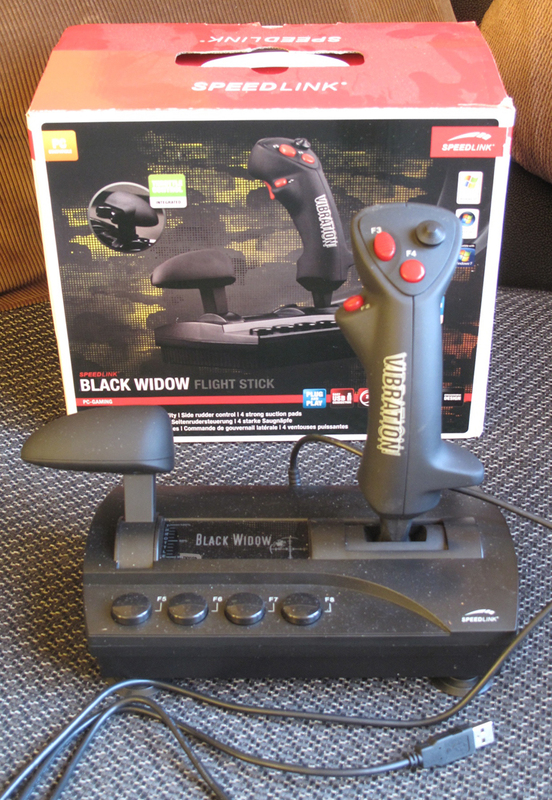 It has two medium-sized joysticks, which are very nice to operate, but no buttons. Examining the controls using the [hid] object in PureData suggested that the chip it uses would support the use of buttons, but this function is not implemented. The essential task, then, with the StyloSim was to add two DB9 connectors, matching the connectors on the UCreate, so the UCreate’s effects could be controlled by the StyloSim, and whatever the StyloSim was used to control (at the moment, just one PureData program I’d written to add volume, filter and panning effects to an audio input) could also be controlled by the UCreate Button. I checked to see that the ‘high’ and ‘low’ ends of the potentiometers in the StyloSim were both the same: they would have to be connected together to control the UCreate, but would also have to be left in a state where they correctly controlled the StyloSim chip. 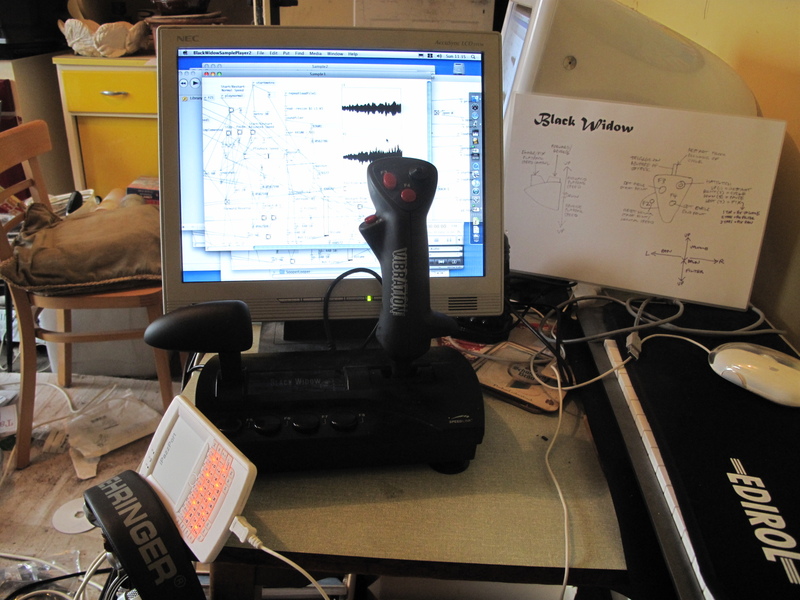 They were connected, so I snipped the 6 wires between the circuit board and the potentiometers of the right-hand joystick (which I called ‘VR1′ and’VR2’). The wires from the potentiometers were connected to the ‘Out’ socket, and the wires from the circuit board were connected to the identical pins of the ‘In socket’. In this way, whatever else I connected, a DB9 lead connecting these two sockets would allow the StyloSim to function as normal. In fact, I had another addition to make: the potentiometers would have no effect unless the UCreate ‘Hold’ switch was on. As with the UCreate itself, I added a 3 way toggle switch, centre off, momentary in one direction, latching in the other, and connected this to the appropriate pins on the DB9 ‘Out’ socket. 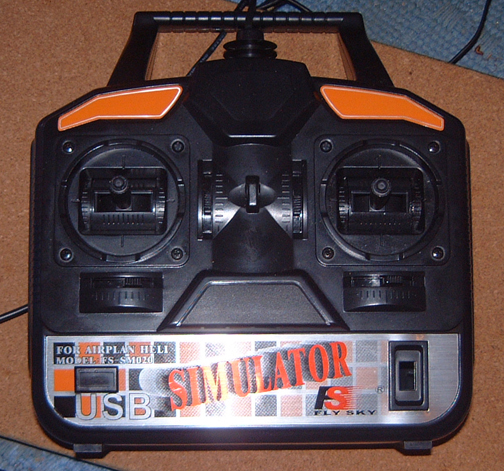 These connections were enough to ensure that, with the use of DB9 leads, the StyloSim could control the UCreate effects, and that the UCreate Button – which had only one joystick – could control at least some of the things the StyloSim could control. 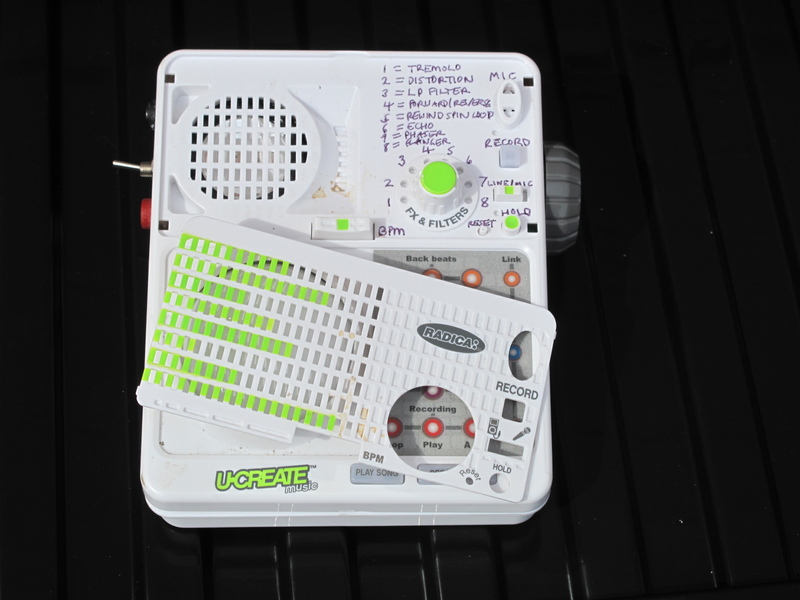 However, the UCreate also now had a ‘Volume Pedal’ output, which just required a potentiometer connected via a 3.5mm stereo socket. As I had two more potentiometers available in the StyloSim, I connected one of these to a switched socket. I used ‘VR4’, the up/down potentiometer of the left-hand joystick, as this was set not to return to centre when released, so would be very suitable for setting a volume level and then leaving it. When nothing was plugged in, the joystick would remain connected to the circuit board inside the StyloSim; when a lead was plugged in, it would control the UCreate volume. (In practice, unlike the volume pedal, the joystick – because of its limited travel, presumably – didn’t take the volume right down to zero, so was less effective than the pedal, but useful as long as complete silence wasn’t required). I also made two more modifications, which weren’t strictly necessary, but which were not too difficult and, I felt, enhanced the design. First of all, I chopped off the USB lead and added a socket instead. This is only because I find it annoying to have fixed leads hanging off devices – it makes them awkward to carry about and store away. Sometimes USB leads are small and fiddly, but at least they’re colour-coded. (There is some variation in exactly which colours are used, however. There’s supposed to be a convention, but as you can imagine, manufacturers find plenty of opportunity to use colour combinations of their own. Those who are colour-blind – like me – have to be especially careful, but more often than not you can work out which lead is which. Looking into a socket from the outside, 1, on the left-hand side, is +5v, and should have a red or orange wire connected to it; 2 is ‘Data -‘, and has a white or sometimes a yellow/gold wire; 3 is ‘Data +’ and has a green or sometimes grey wire; and 4 is Ground, with a Black or sometimes Blue or Brown wire. I have come across other combinations, unfortunately, of which those using white or yellow for ground are the most annoying. Often there are 5 wires, with an extra connection – frequently black – for the shield around the cables. Looking into a plug, 4 is on the left-hand side and 1 is on the right. I’ve mentioned before that I shouldn’t be using Type A sockets as the output of a device that’s being connected into a Type A socket – on, for example, a computer. I should be using a Type B or mini USB socket; but this rule is to avoid connecting two devices together that both supply power, which might cause excess currents and start fires, and this isn’t going to happen with the devices I’m using – the StyloSim, for example, receives 5V from the computer, but doesn’t provide power of its own). 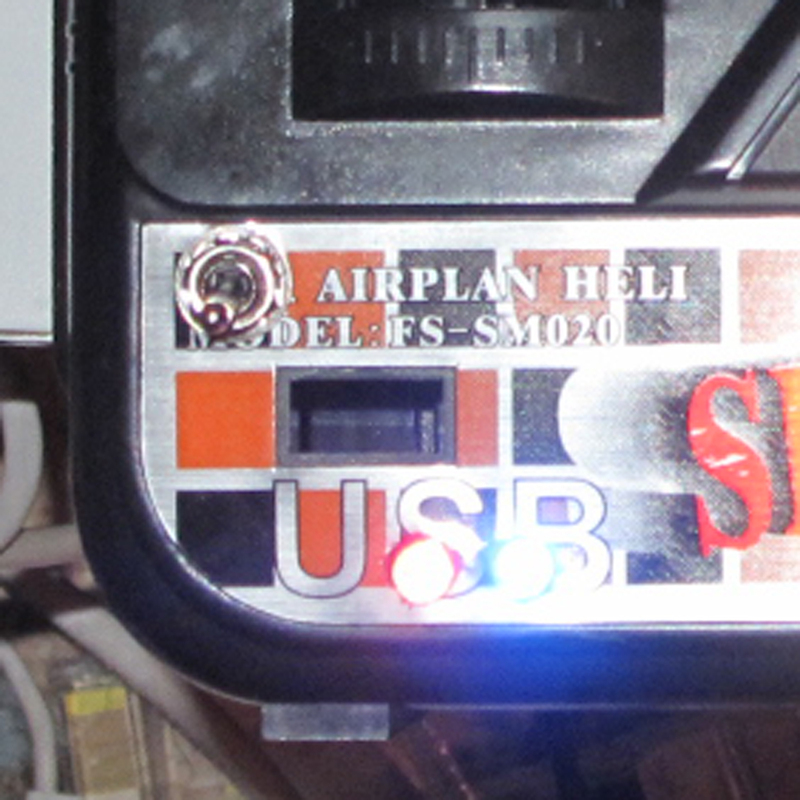 Finally, partly as an indicator that the connection with the UCreate had been properly made, partly because flashing lights are always good, I also added blue and red LEDs to the front of the StyloSim, and connected these to the relevant pins on the ‘Out’ socket. These flash in time with the rhythm of the sounds from the UCreate, when the ‘Hold’ switch is on, so you can tell if the UCreate is ready to receive instructions. Essentially, I did exactly the same to the Black Widow. The big joystick on the right-hand side was connected to the DB9 ‘Out’ socket, and the ‘throttle’ on the left-hand side to the 3.5mm volume socket. 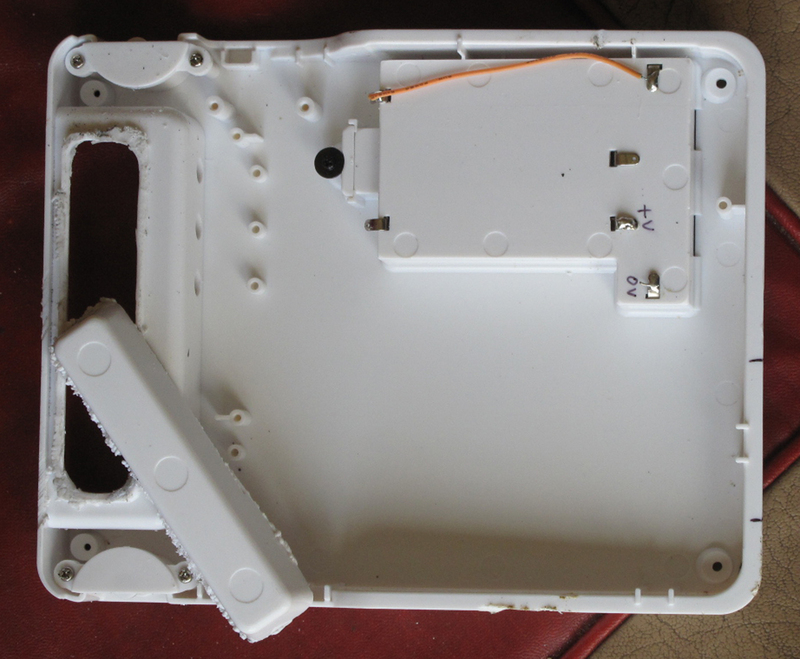 In this case, however, there were buttons available, so I was able to use the ‘F4’ button on the top of the joystick as a momentary ‘Hold’; for a latching Hold, I added an SPST switch at the bottom of the front panel, plus the two LEDs, which are illuminated when either Hold switch is activated. 1. External power supply. I was pretty certain the UCreate would work with a 5v supply, and was about to use an old mobile phone charger for this purpose; but while I was looking through things I had lying about, I found a better quality one which I’d been given and which was rated at 5.5v, 350mA. I replaced the connector with a 3.5mm mono plug to match the socket I’d installed in the UCreate, and it seemed to work perfectly, cutting out the battery supply when plugged in, and powering the device. 2. Switch box. 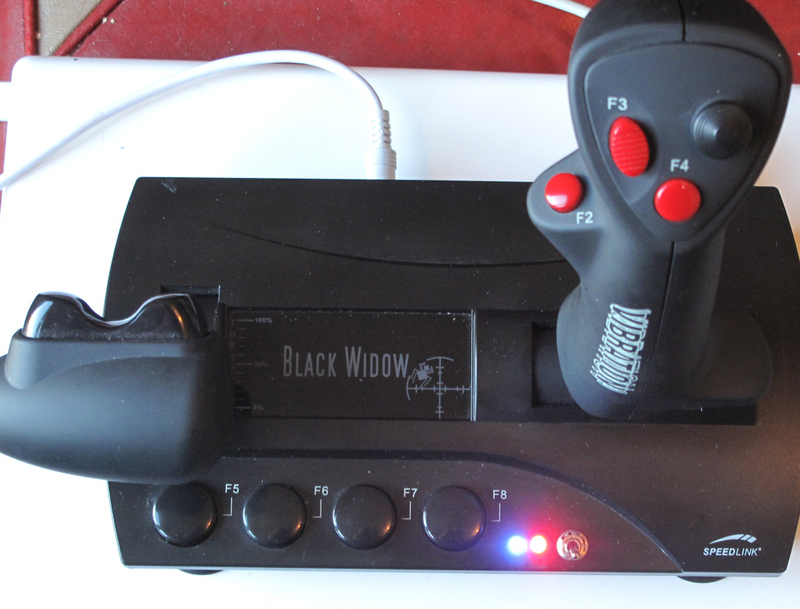 It occurred to me that there might be occasions when, if I was using the Black Widow and the UCreate at the same time, it might be handy to be able to swap the joysticks quickly from controlling one thing to another, and a way of switching the DB9 leads from one device to the other would be useful. 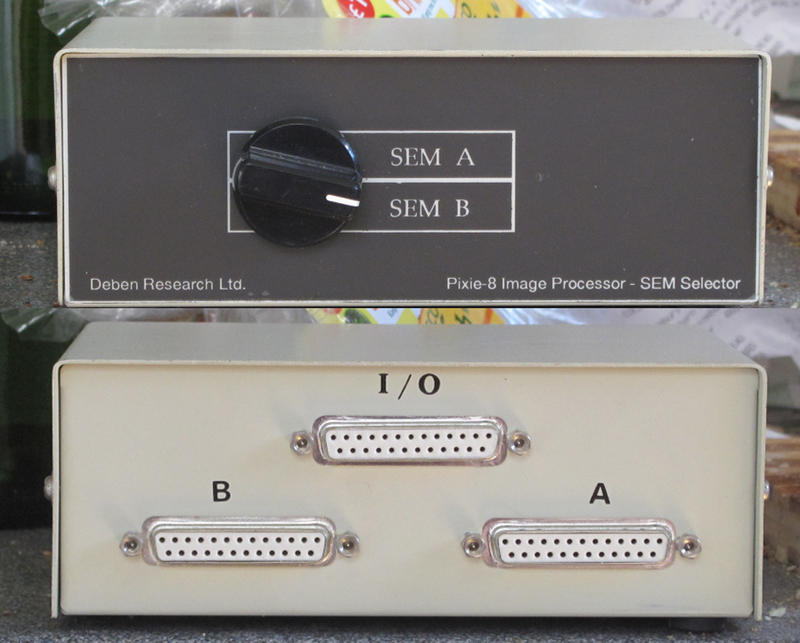 I was looking into buying a DB9 switch box, which would have been about £5 – £6, but in the end I decided to be stingy and bought three DB9/DB25 adapters for about £4, as I found an unused two-way DB25 switch box amongst my stuff. I had bought this for an as-yet-unrealised MIDI project: as this will probably remain unrealised for some while, I thought I might as well use it in the meantime. 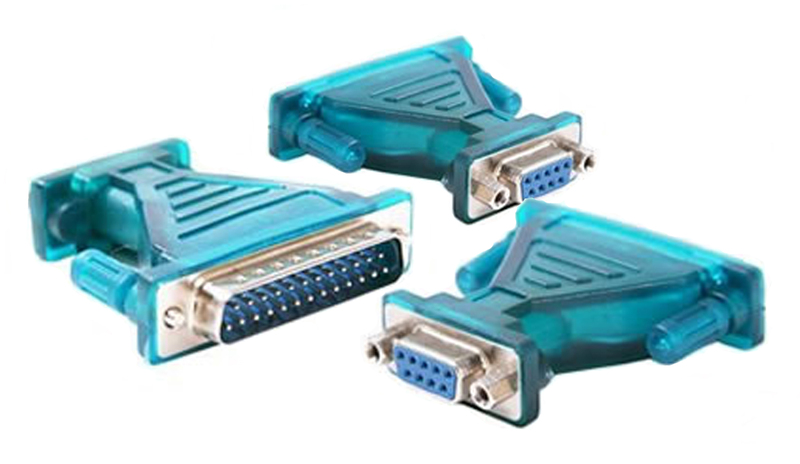 I did find a diagram on the internet to show how the DB9 pins were, according to the RS232 standard, allocated to pins on the DB25 connector, but it doesn’t really matter, as all 3 connections (in/out, A and B) will be the same. 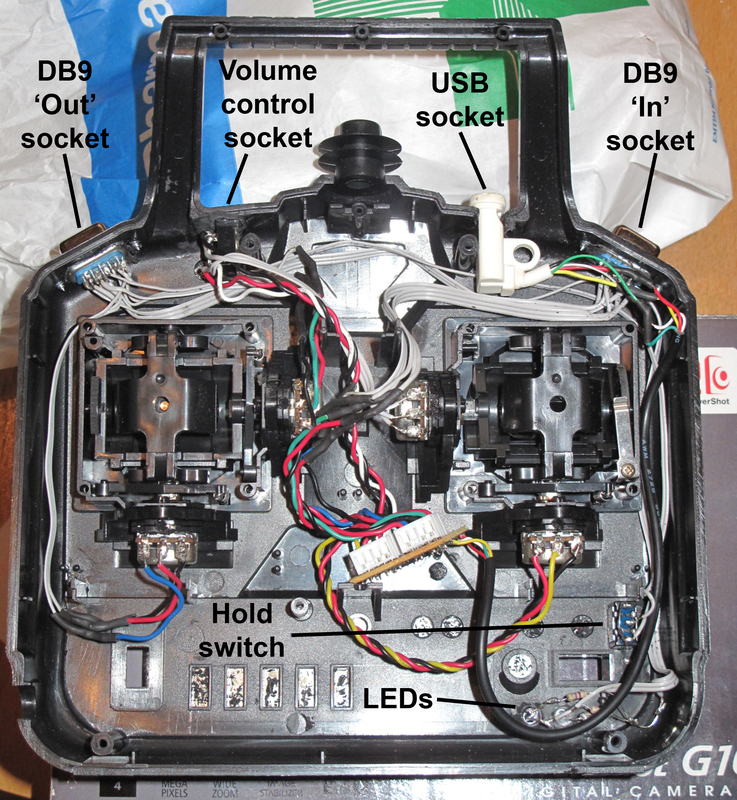 The Black Widow ‘Out’ is connected to the ‘In/Out’ socket on the switch box; ‘Out A’ is connected back to the Black Widow ‘In’ socket; ‘Out B’ is connected to the ‘In’ socket of the UCreate. 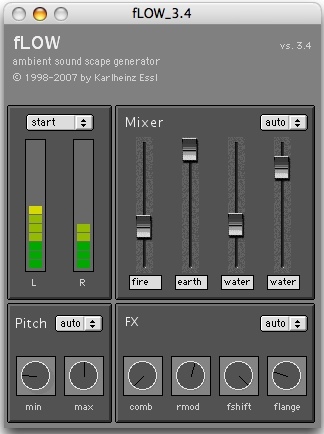 This allows some feedback sounds to be added to the linked samples or to sounds at the line or mic in sockets, and the amount can be limited by the volume control. 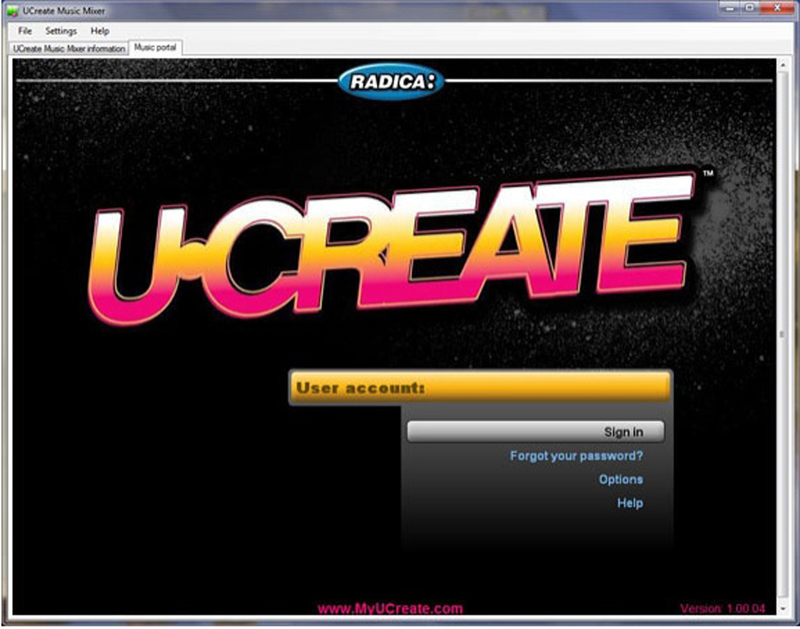 In Part 3 of the series, I look at the UCreate software. This post concerns a very interesting device which was made a few years ago by Radica, a Mattel company. 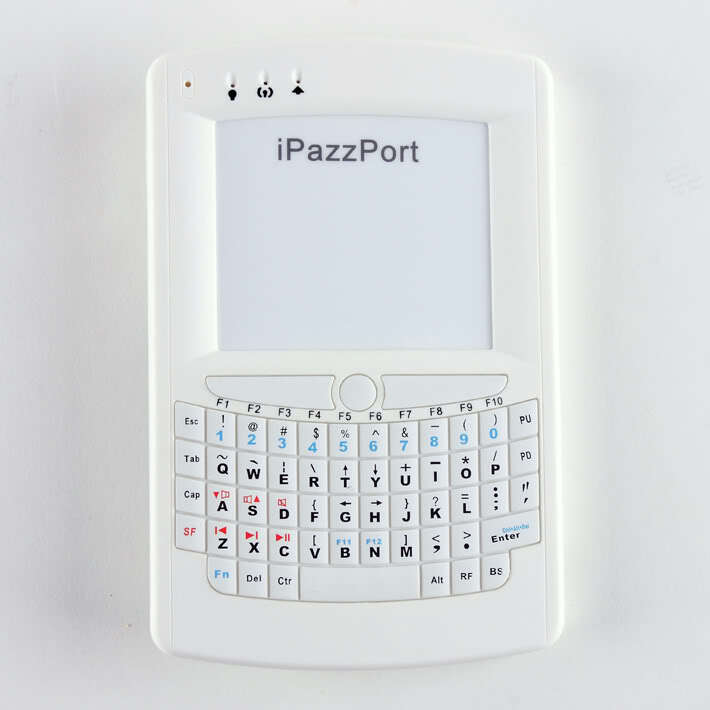 It was manufactured for a very short time between 2009 and 2010, and supported only until 2011, but examples still appear on eBay, sometimes for very reasonable prices. I got mine for less than £10, which I thought was pretty good for a comparatively sophisticated machine. The way it works is by playing loops, which you can choose from its memory – one each from 4 banks of 3 loops, in the categories ‘Back Beats’, ‘Riffs’, ‘Licks’ and ‘Runs’ – and apply effects to. 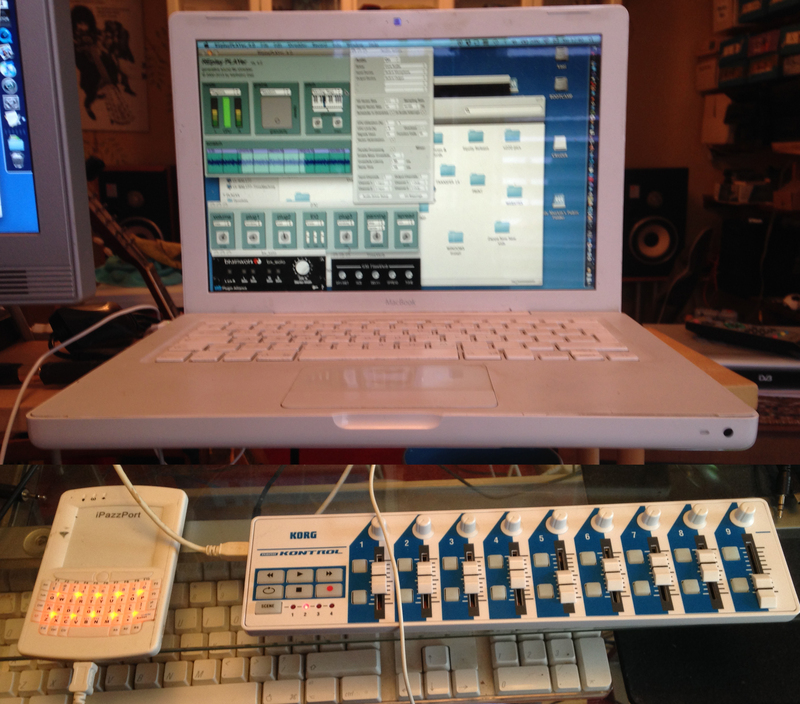 You can also record two of your own samples to add into the mix. 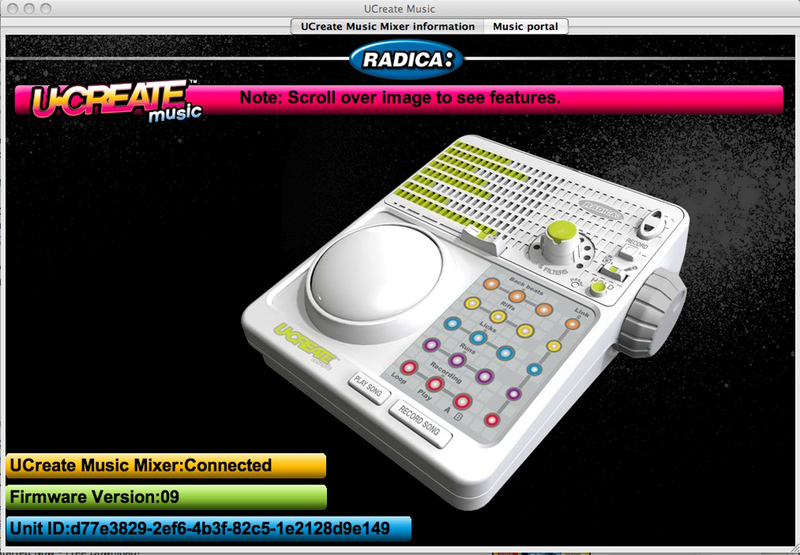 There are two reasons why the UCreate captured the imagination of electronic music-makers. 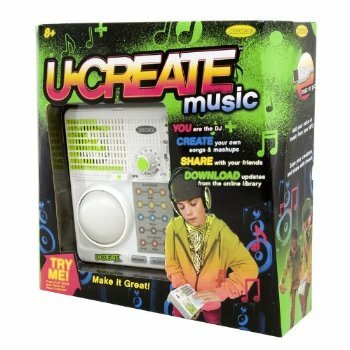 First of all, you could connect it to your home computer via a USB socket on the back and make use of software that would allow you to save recordings of songs, reorganise the loops and effects and download new loops from Mattel’s UCreate website. I’ll return to this topic later. The second thing was the range of 8 special effects, and the fact that these are available not only to the loops played back by the UCreate, but also to any audio source connected to the Mic or Line in sockets. The effects – referred to as ‘FX and Filters’ – comprise Tremolo, Distortion, Flanger, Phaser and Echo, a variable low-pass filter, and two unique and unusual effects called Forward/Reverse Looper and Rewind Spin Looper. 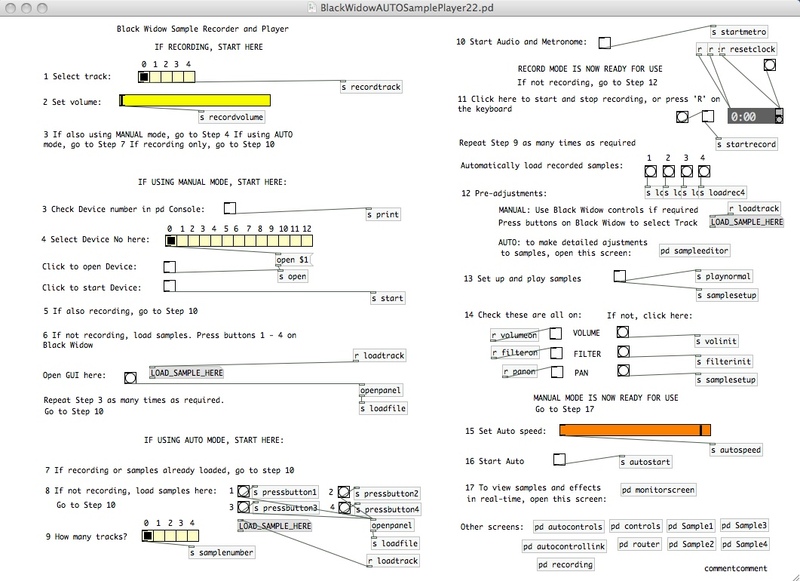 These work by recording very short samples and replaying them in various ways controlled by the user. 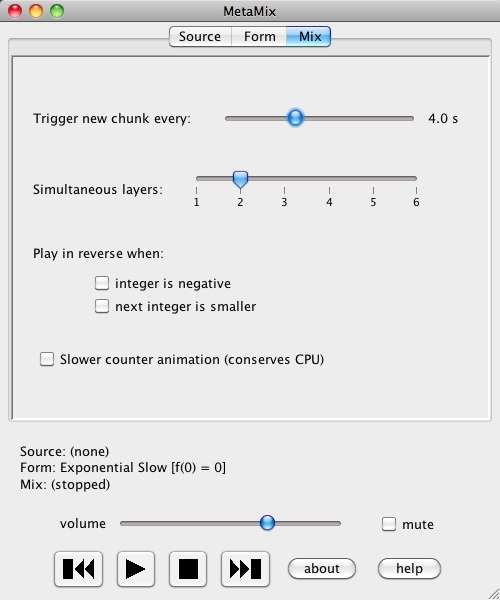 The way the effects are controlled is also highly unusual: a large Button on the front panel can be pushed and tilted left/right and up/down to vary two parameters of the effect – for example left/right controls the speed of the flanger, up/down controls the depth. If you find a setting you want to leave for a while, a ‘Hold’ button fixes it where you’ve set it until ‘Hold’ is pressed again. The fact that the whole Button is lit up when in use with flashing blue LEDs is just the icing on the cake. 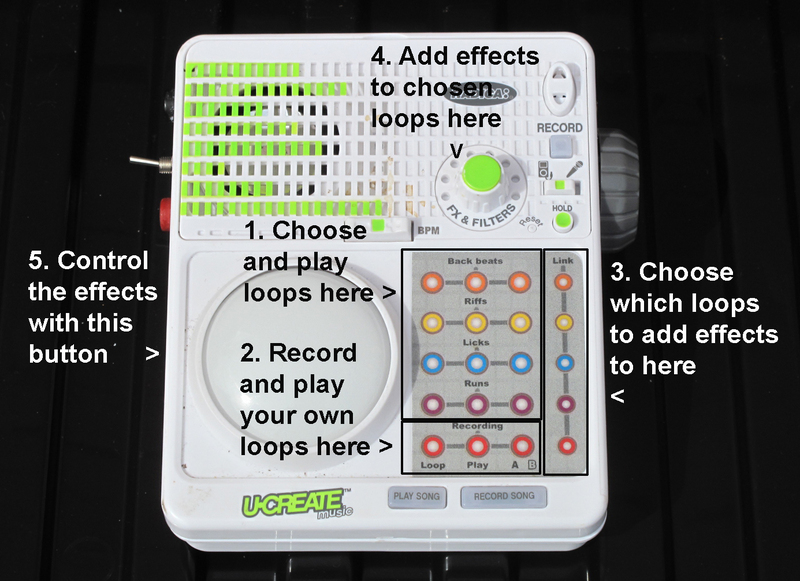 Leaving aside the loop playback feature for the moment, this effectively makes the UCreate an inexpensive, but versatile multi-effects unit, playable in real time. Although only one of the effects is available at a time, the Forward/Reverse Looper and Rewind Spin Looper in particular, together with the ability to control these in real time with the Big Button, makes the UCreate a useful and unconventional device to have. 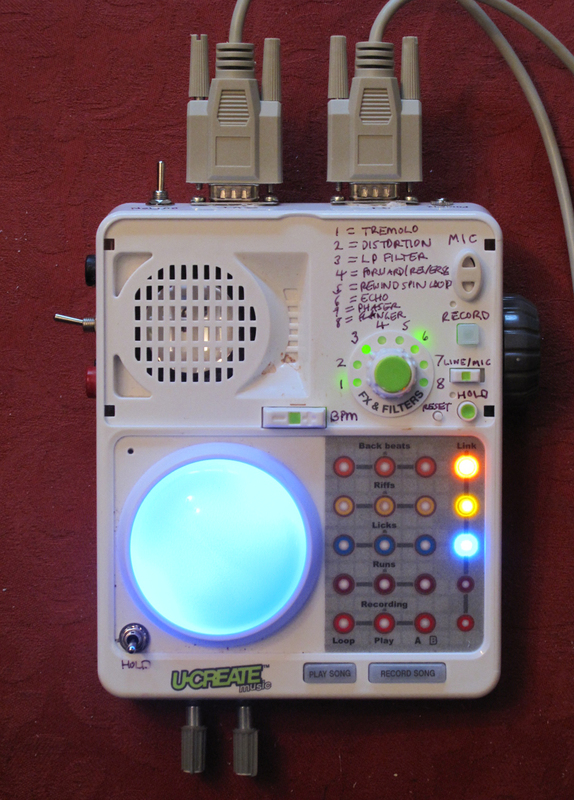 I began by using the UCreate in this way, making just a couple of small modifications to it. First, I added a socket for an external power source; then, as I had done with a number of my other instruments, I added banana sockets for connecting a larger external 8ohm speaker and a DPDT switch to cut out the internal speaker when this is in use. There is a headphone/external speaker socket on the back of the Ucreate (which also cuts out the internal speaker when a plug is inserted), but this is a 3.5mm stereo socket, as you would find on a PC or mp3 player and is more suitable for use as a Line out. Next, imagining a situation when both hands might be occupied in operating the loops and effects and not able to control the volume, I added a socket for an external volume pedal. This was a 3.5mm stereo socket with internal switches, like the Line out socket. I used a small size socket purely because of the lack of space inside the case. On the small circuit board attached to the on/off/volume control, I broke the connection to the centre of the volume potentiometer and rewired it to the socket so that when nothing was plugged into it, it was connected directly to the main Ucreate circuit board, as originally designed; when the volume pedal was plugged in, the potentiometer in the volume pedal was added into the circuit. This would enable the maximum volume to be set by the original volume control and the pedal to move between this and zero volume. 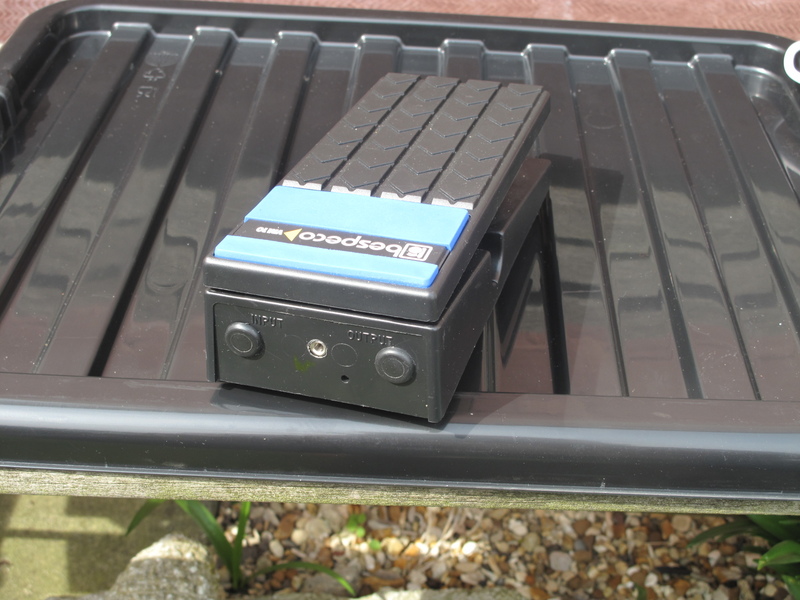 The pedal itself was simply a cheap second-hand Bespeco volume pedal. 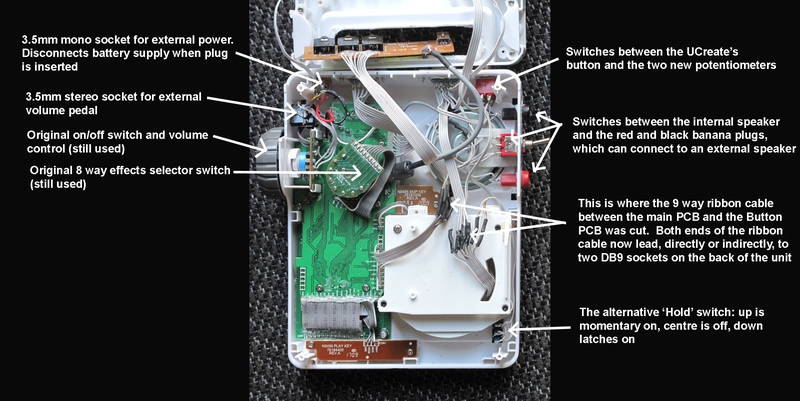 I removed the original sockets and the circuit board inside and connected the potentiometer to a 3.5mm socket, wired in a similar way to the socket inside the Ucreate. The tip was connected to the input from the Ucreate and the ‘high’ end of the potentiometer in the pedal, the sleeve to Ground and the ‘low’ end of the potentiometer, and the ring to the potentiometer wiper, the centre tag. (I should have built this before, as it would have been useful with many of the instruments I had made or modified, and I’ll have to consider retro-fitting sockets to them so it can be used). I then decided to take a closer look at the big control Button. I tried dismantling the mechanism, but couldn’t seem to get it completely apart. This may have been because it was pressed or glued together after the circuit board was wired in, and I wasn’t going to risk breaking it by trying to prise it apart if it wasn’t meant to do that. 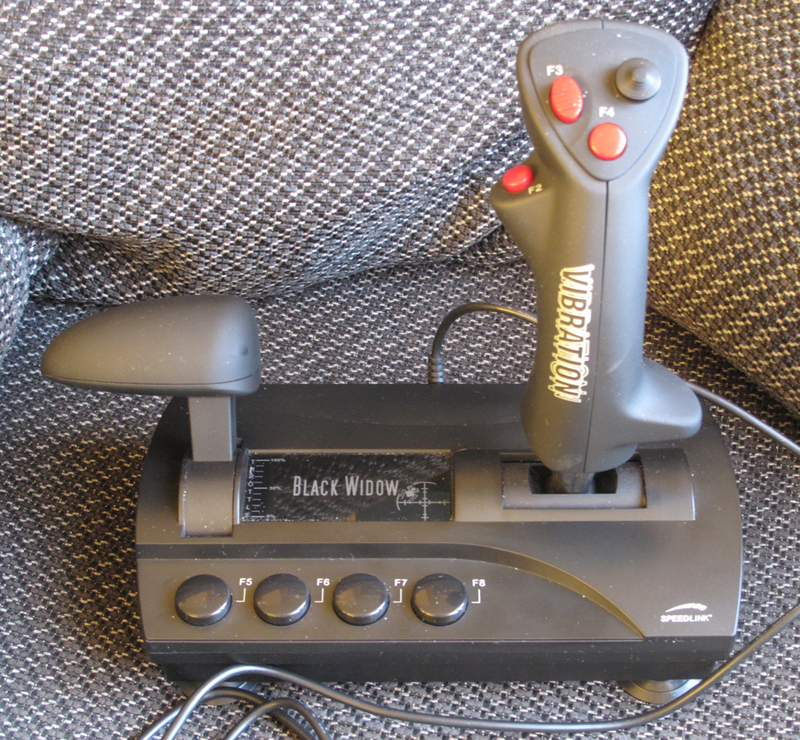 However, I got it apart far enough to see that it used a joystick for the left and right and up down movement. This was mounted on a small PCB, and on the bottom of the PCB there were three momentary switches, set out in a triangle. These were like the ones you often get on game controllers: they’re soft and squishy, and when you press them they join two contacts on the PCB; when you take your finger off, they spring back into shape and the connection is broken. All three switches were connected the same, and later experimentation showed that they had exactly the same function as the ‘Hold’ button, except they were momentary instead of latching. 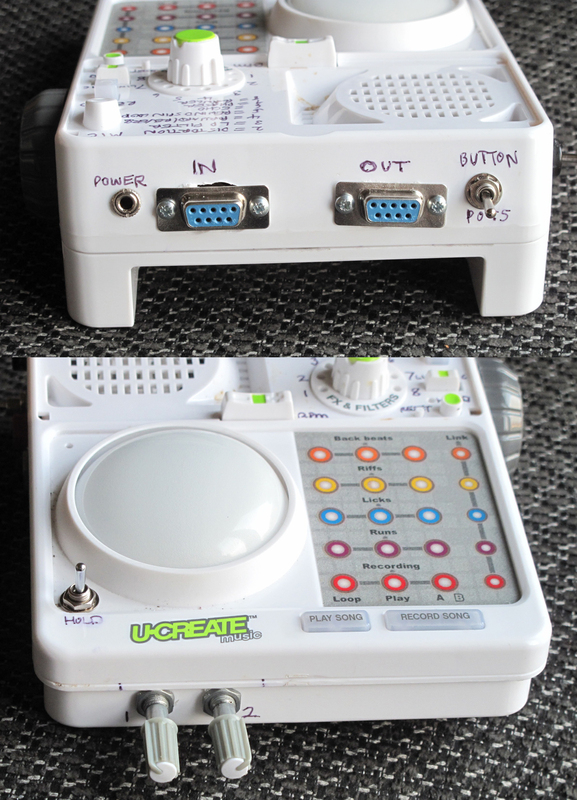 This gave me two thoughts: first of all, with essentially a joystick and a momentary switch under it, it would be possible to use the UCreate’s Big Button to control another instrument or effect that normally used a joystick or two separate potentiometers; and secondly, there was no reason why the UCreate couldn’t be controlled by two potentiometers or an external joystick. The way to do this would be to put the Button back and separate the connection between the UCreate’s main PCB and the Button PCB, and then route these connections elsewhere. The link was made with a 9 way ribbon cable; the names of these 9 connections were printed on the main PCB, and even where this didn’t mean a lot, it was easy to follow the the tracks on the Button PCB and see what their functions were. So I cut the cable. Essentially what I did was to connect the end of the ribbon cable that came from the main PCB directly to a DB9 connector on the back on the case. This was marked ‘In’. The other end of the ribbon cable, the one from the Button PCB, was connected to another DB9 connector, marked ‘Out’. 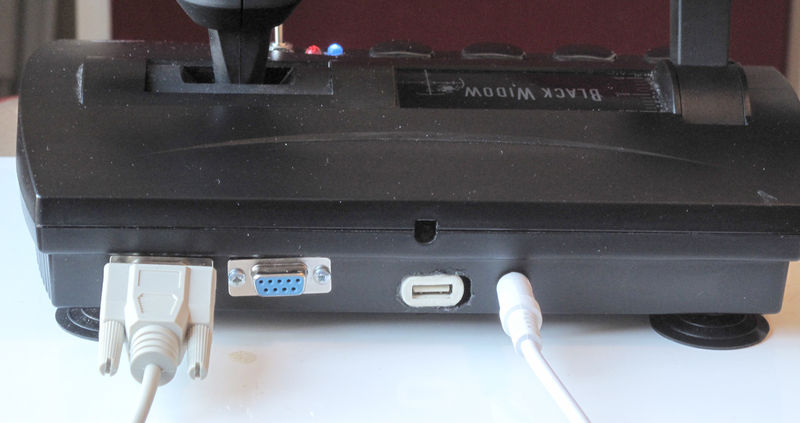 In this way, if you wanted to control the UCreate from another device – a larger joystick, perhaps – all you would need to do was connect it to the DB9 ‘In’ socket; if you wanted to control another device with the Big Button, you would connect the other device to the DB9 ‘Out’ socket; and to use the UCreate as normal, just connect the two sockets together with a DB9 cable. I think this was probably a carrying handle, but I didn’t think I needed it, so I sawed it off and created a lot more space in the back of the case. In fact, I didn’t connect the Button directly to the ‘Out’ socket. Although the Button works brilliantly well for the Reverse and Rewind ‘stuttering’ or ‘scratching’ effects, there was a lack of precision when it came to such things as the filter cut-off frequency, speed and depth of flanging, and so forth. Apart from anything else, joysticks don’t usually use much of the possible travel of an ordinary potentiometer, so there was also a restricted range over which the Button was operating. So I decide to squeeze a couple of potentiometers into the case, which would be selectable in place of the Button. The two connections for the centre tags of the potentiometers (‘Line 2’ and ‘Line 3’) coming from the Button PCB went to one side of a DPDT switch, and the poles went to the DB9 ‘Out’ socket. The wires from the other side of the DPDT switch went to the centre tags of two potentiometers, which I squeezed in the front of the case. The two connections for the ends of the potentiometers went to the potentiometers and to the socket. 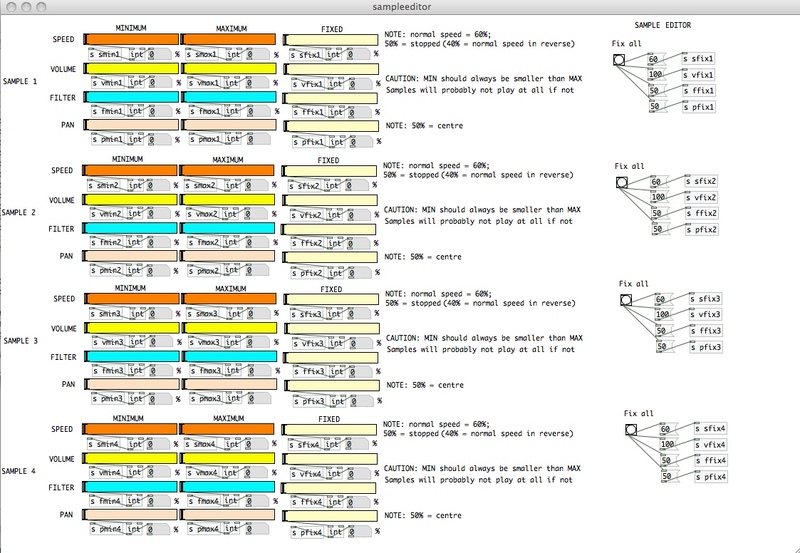 In the event, I also added a 10k preset, set at about halfway, in the circuit at the potentometers’ ‘bottom’ end: it seemed to me that some parameters – e.g. the filter cut-off frequency, and the volume pot when using the tremolo effect – were going too low, at the expense of effects that could be obtained with higher resistance. 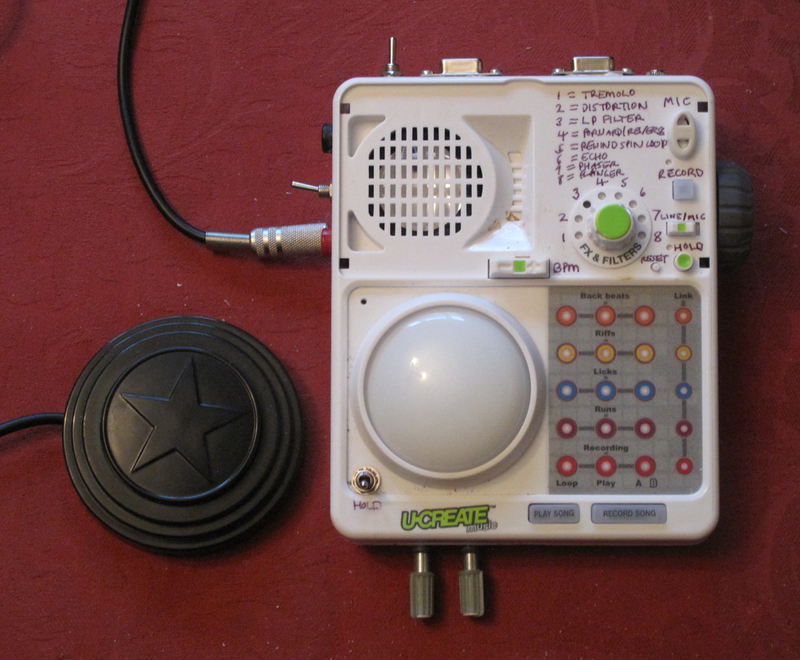 The way the UCreate works, the potentiometers – and the potentiometers under the Button, come to that – have no effect unless one of the ‘Hold’ buttons is pressed, so I needed to add a momentary button, preferably somewhere near the potentiometers. There was just about room, and what I decided to use was a toggle switch with a centre off position, momentary on in one direction, latching on in the other. This would enable me to engage the momentary switch, adjust a potentiometer, then when I had exactly the sound I wanted, latch the switch on. So the two connections for the switch went both to the DB9 socket and to this new switch. In fact, they went to a third place: a standard (1/4″ or 6.35mm) mono jack socket to which a ‘Hold’ footswitch could be attached. I used a standard size jack in this instance because I had some nice ready-made footswitches: they’re apparently sold for use with tattoo machines, but come with standard jacks attached, which is very handy. I don’t know if they’re all the same, but the grille on the front of mine came off very easily, so I took the opportunity to remind myself of what the 8 effects are, and what order they come in. In Part 2 of this series of articles I describe modifications made to some other devices in order to work with the UCreate.